You can buy whatever glass candle holders you like (or use some you already have laying around). They are available inexpensively from department stores. You can also find them frequently at thrift stores or yard sales. Author Rachel Paxton is a freelance writer and mom who is the author of the Creative Homemaking Recipe of the Week Club Cookbook, a cookbook containing more than 250 quick easy dinner ideas. 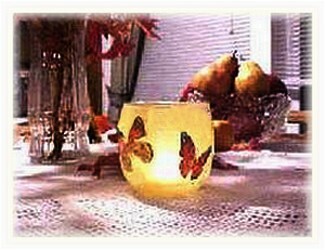 For recipes, tips to organize your home, home decorating, crafts, and frugal family fun, visit Creative Homemaking.